There were really 2 moments that changed my photography. I have always aspired to take good landscape pictures but largely failed to reach my own goals, for the first 20 years of taking pictures I chased butterflies & insects and landscape photography was a second interest. I was always trying to squeeze the best quality out of 35mm film whether it be Kodachrome 25 or Tech Pan and still didn't get the subliminal quality that I desired. Whilst living in Australia in 1989 I came across a book by John Sexton - 'Quiet Light' and that really made me stop and stare. It was a few years later that I realised the significance of that moment and made a move from 35mm to MF and then on to LF and the start of the process of getting what I wanted in my landscape photography. The second was more of a short period around 1999/2000 when Robert White held a few seminars by Charlie Waite & Joe Cornish among others and this gave me hands on view of the wonderful work from Joe and what you can do with an Ebony. 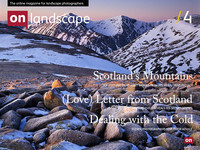 It also prompted me to book on a Light & Land course with David Ward in Glencoe in January. My wife bought me a surprise xmas present of an Ebony RSW that year and off to Scotland I went with it leading to a long association with 5X4 and Ebony in particular. A course with someone like David or Joe really lifts your ambition and ability - the number of 'aha' moments when things start to make sense is worth years of solitary learning. It was really basic stuff like take pictures at dawn and dusk that had previously somehow passed me by. Your landscape photography has been taken on quite a range of cameras from GF1, Olympus EP1, Arca and Ebony large formats, Nikon DSLR's, etc. What do think are the advantages of disadvantages of each format and when do you use them? This is a hard question to answer today as the quality available from all the formats is so far in advance of 10 years ago. 5x4 is still very special, a well exposed & composed Velvia 50 transparency on the light box beats anything else hands down but it is only arrived at by good planning, sound technique and a sprinkling of luck. You have to anticipate the light and conditions and really understand your medium to get the best from it. Arca or Ebony... well head and heart and that is all I want to say about that. I am back with Ebony now and both cameras are not limiting the photographer under the dark cloth ! Of the other stuff, when you need to anticipate the light, none are a replacement for 5x4. I use Nikon because I always have, I need it for my insect and flower work as I am not brave enough to chase butterflies around a field with 5X4 or an m 4/3rds camera. The wide angle options on 35mm digital remain compromised in quality and distortion when you are used to 5x4 and don't provide an equivalent solution for landscape work IMHO. The genre of micro 4/3rds cameras at last get some way to a portable solution with wide angle lenses not compromised by the design constraints of a mirror but come with a crop ! Today, these cameras provide my walkaround solution and I am very happy with the quality from them. You have started using colour negative film as well - how do you think this compares with digital/transparency and what methods do you use to invert the picture after scanning? I have shot colour negative only in the last 2-3 years as I really got to quite dislike the results from Provia. It was my answer when I couldn't squash the range of tones that I wanted into Velvia 50 so I needed to seek an alternative. Colour negative film has the reputation of being forgiving in exposure and having great latitude so is the perfect answer until you try to turn those orange tones into something looking like the scene you started with ! Right now I don't have enough experience to have a fixed repeatable workflow. I use exclusively Pro 160S from Fuji and find that sometimes Vuescan gives the best scan sometimes Silverfast and sometimes something else with no apparent rhyme or reason. After scanning as a negative ( I let the scanning software invert prior to output) I always import the file into Lightroom and auto balance and tone as a starting point, for hard negatives I might auto colour in CS4. From there it's the same as any other picture with tweaking colour & saturation to get what I envisaged when I took the shot. Which photographers do you think influence you (conciously or unconciously) and which photographer(s) do you admire despite being in a different landscape photography 'genre'. Charlie Waite, David Ward, Joe Cornish and David Noton but a significant part comes from more personal interactions with friends who I photograph with especially Jon Brock with whom I have shared many steps of my own journey during the last 10 years. Light & Land Advanced Large Format courses have given a window into some great photographers whose work I would never have seen or been inspired by, Nigel Halliwell, Anna Booth, Roger Longdin, Sami Nabeel, Julian Barkway to name but a few of many. Seeing how other photographers approach a subject and get the best out of a medium provides the knowledge base for heading out into the field. Things like how velvia 50 responds to blue sky light when photographing a subject in the shade is one example of a piece of 'inspiration' that I carry out into the field that I wouldn't have known without looking at work of Anna Booth or David Ward. There are many others that you just absorb and then build on when you go out. The rest for me is down to what looks and feels right through my eyes. I typically set up quite quickly when on location and then make decisions about lenses, film and timing and tweak the final composition. I will often potter about with the digicam for a while if inspiration doesn't hit me on arrival. I did use a finder but found it interfered with my wide vision. From then on its fairly simple waiting for the light, working out the metering in advance with my Pentax spotmeter, gradding if required and then patience. You work a lot in Robin Hood's bay and the surrounds, what particular features make this area a unique place in your opinion? For me its unique because I have bonded with it in a way that only comes with being there over a long period of time. For the most part I think that the best landscape photographs come from a place the photographer has emotionally bonded with, understands and can relate those feeling to the viewer via the picture. RHB is not unique in terms of features and light but emotionally I feel close to the landscape. Similarly I have been visiting Glen Coe and Glen Etive every Winter since 2000 and my pictures have improved year on year as a result of getting to understand how and when the light plays with the landscape in different weather conditions. Its not that you cant take good pictures as a tour bus photographer on a first visit but pictures of depth and emotion only come with repeated visits. I know you go out taking pictures with Jon Brock quite often, do you take different pictures when are out with other people? How does your photography change when you are out on your own? A good question. Yes I think I do take different pictures when out with others, especially those whose work I know and respect. Probably the main reason for this is that I will visit locations that I otherwise wouldn't photograph in and then I look for pictures in the genre that suit the location even if they don't naturally appeal to me. I love taking more traditional landscapes but can have a happy few hours in a details / abstract location even though I don't want to put any of them on my wall. On my own I will look specifically for what interests me and take that uninfluenced by others. A big thanks to David for his frank and very interesting answers - you can see more of his photography at his own website and his flickr stream.